The United Kingdom is home to the sixth largest video game market worldwide as of 2016, with a revenue of 3.94 billion U.S. dollars. Growth is forecast for both the global and UK games markets, though not all industry sectors have fared well in the United Kingdom in recent years. 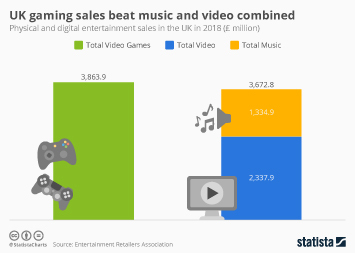 The industry, once primarily based on revenue from gaming consoles and game software sold in disc format, now relies on income from online and mobile gaming to maintain growth. Gaming console sales revenue has fallen since 2010, but was boosted in 2013 and 2014 by the release of the next generation Xbox One and PlayStation 4 consoles. Game accessories revenues also decreased since 2010, but have shown growth in 2014 and 2015. Digital sales revenue of game software has grown as consumers move online to purchase and access entertainment content, and overall video game software retail sales revenues have grown. The data reflect shifts in game consumption patterns and gamer demographics. As mobile phone and tablet penetration increase, gaming on these devices via mobile apps has become more common, while playing on a games console, PC or handheld games player has lost popularity. Consumer spending on mobile games increased rapidly in recent years, growing to exceed 995 million British pounds in 2016. Gaming continues to gain popularity as new demographic groups connect with games online and on mobile devices. Video gaming via any device has grown from 31 percent penetration in 2007 to 44 percent penetration in 2014, but fell in 2015. Gaming on a mobile phone has increased, particularly among those aged 25 to 34 and 45 to 64. During a survey carried out in 2014, researchers found that gamers are now more likely to be female than male.